No, it’s not just fat! Cellulite is more of a product of a bigger process. As we age, collagen and other supportive proteins decrease as fat store increase. Simply, it’s fat cells that have been pushed against weakened fibrous connective tissue, like a hand against mesh. Moreover, it’s these fat cells that push from beneath causing the skin to bulge and fold in uneven patterns. This causes the signature ‘orange peel’ dimpling that many of us have grown to hate. The good news? Besides being unsightly, having dimpled legs is non-life-threatening. In fact, most doctors treat it as a cosmetic issue. As with most things, what causes this unsightly problem is typically a multi-faceted issue. 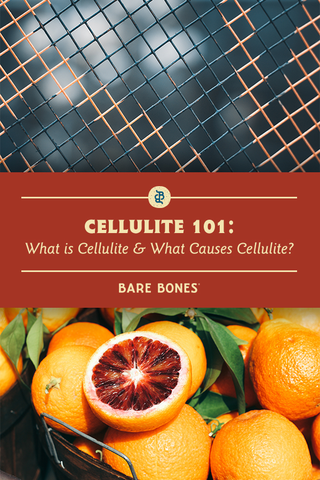 Many factors are in play determining the severity of a person’s cellulite. Although there are a number of reasons one might notice dimpling, here are a few of the leading causes doctors see. The cause of cellulite can vary as much as the individual person, however there are a few leading factors. One leading cause is poor diet. Those who consume a diet low in nutrients are more susceptible to weakening of fibrous connective tissues. Additionally, foods like processed meats and cheeses, high-sugar beverages, and trans fats are inflammatory to fat deposits. Added fat can further press on your bumps as well making it more obvious. Those looking to avoid the effects of cellulite should practice clean eating and regular exercise. Hormone changes might also play a role with cellulite. Women feel this specifically anytime estrogen levels change. Estrogen levels directly correlate with the production of collagen, which is vital for connective tissue. This is why women tend to develop this unsightly issue after puberty and see further aggravation post menopause. Finally, genetics is sadly the primary cause of unsightly cellulite. Experts are unsure how exactly, but signs point this way. Researchers have noted the cottage cheese appearance on athletes, supermodels, and even the naturally thin. If you feel you are naturally prone to dimpling, be proactive. Supplement your diet with foods that will assist in collagen production and absorption. Although it is largely unavoidable, there are treatments available that can minimize the appearance of dimpling. Treatments can range from cost free exercise to triple-digit laser treatment. No option is more correct than another, it’s simply what fits you best. If you’re looking for a more natural cellulite treatment, try starting with these non-invasive and minimally invasive options first. One popular remedy to lessen skin texture issues is dry brushing. This ancient practice has been utilized by the Japanese to the Ancient Greeks. The method is done by taking a natural fiber brush and gently brushing the skin in circular and sweeping motions. Dry brushing has been praised for exfoliating skin, improving blood flow, and reducing the appearance of cellulite. People have seen varying levels of success with this treatment. However, some simply choose to keep the routine for the enjoyment of brushing. Another strategy for minimizing cellulite is with collagen peptides. This easy-to-use, flavorless and odorless protein powder is highly touted for its plethora of skin benefits. Regular consumption of collagen has shown improvements in overall joint mobility, gut health and digestion, skin, hair and nail health. One study found that long-term supplementation of collagen peptides leads to an improvement of cellulite and has an overall positive impact on skin health. Alternatively, look to your diet for missing links. Bolstering your diet with more collagen rich foods can help slow the natural decline of connective tissues. This makes bone broth is an excellent choice for assisting in the the reduction of cellulite. Bone broth is not only thick with collagen stores. Additionally, people enjoy its wealth of proline and glycine: important to the production of collagen. Not a fan of the flavor? Explore bone broth smoothies and other sneaky, nutritious recipes. One of the most simple and effective ways to beat cellulite is with good old exercise. Excess fat behind cellulite cells can cause added strain on weak connective tissues. This only further aggravates the orange peel dimpling. Regular cardio and strength training can successfully mask most signs of uneven bumps. This paired with a healthy diet can lead to a more optimal body fat percentage without the need for medical treatments. Regardless of the reason, cellulite will always be a problem that most women have to deal with eventually. If you are concerned, consult with your physician before making any big changes or procedures. However, don’t sweat it if your bumps won’t budge. Your body is unique and fine-tuned to self heal. Cellulite has no effect on that! Be grateful and remember how amazing your body is for taking your adventure this far. If over 90% of the population can carry on with bumpy thighs, we have no doubt you’ll be able to survive and thrive as well.